On Friday, April 5th, a Starfleet starship's worth of people beamed onto DeVos Performance Hall, some in uniform. One woman, waiting in line for a drink, turned to her companion and said, "See? I could have worn mine." The evening began with a screening of Star Trek II: Wrath of Khan, a film about genetic engineering, self-sacrifice, and bugs that slide into your ear and control your mind. People cheered as the opening credits listed familiar names. The film, well-paced and wonkily-plotted, concerns dark plans by Khan, an aging villain with a well-muscled chest and a respectable mullet. His dark machinations pull Admiral James. T. Kirk from an administrative position and back into captaining the iconic USS Enterprise. In the course of events, Kirk will meet his son for the first time and speak with his closest friend for what seems to be the last. Kirk is played by William Shatner. But he isn't played the way you might think. In the popular imagination, cemented by years of parodies, Shatner has two modes: pausing and emoting. One surprising aspect of the film is that it reveals Shatner to be a capable actor. At times he settles into a roguish charm, as when he admires the Vulcan Saavik (the film debut of Kirstie Alley). At other times, he displays the quiet intensity of authority under pressure. There are no perfect films. Wrath of Khan's plot cheerfully dispenses with believability whenever it needs to. A cave scene meant to inspire transcendent awe looks as false as a Thomas Kinkade painting. But it's an able and entertaining movie, still beloved. "It really holds up and is emotionally moving," Shatner told me. He talked about how the first Star Trek film wasn't a success, and the second was only made because the wife of the head of Paramount insisted he make it. "We went back to the reason the original show was successful: the story. We needed an original story that was, yes, science fiction, but that had a humanity about it. And this did. It begat the whole panoply to come." After the film, Shatner came onto the stage, accompanied by WGVU's Shelley Irwin. For an hour, she prompted him with questions submitted in advance by audience members. The questions, mostly uninspired, asked about his favorite co-stars or how he landed the role. 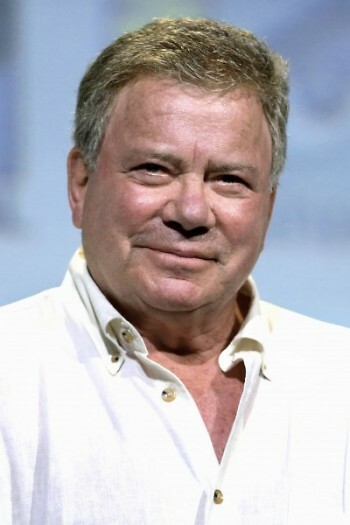 With minimal effort, Shatner segued into well-honed anecdotes. Audience members are unlikely to soon forget the resurrected rabbit or the disappearing bagels. He paced back and forth onstage, belying his age; he cannot be 88. I asked why, at this age, he continues to put energy into these shows, suggesting he must do it because he, simply, loves it. As an answer of sorts, he told me an anecdote that he would also tell onstage, about being pulled over for speeding. "Now, I tell stories like that to people like you, but I'll think, boy, I could have said that better or this better. The stage lets me tell it better." "I know a great deal about loneliness," he added. Seeing him onstage, you wouldn't have known it, but then, that may have been the point. For glorious stretches that evening, there was nothing but connection.